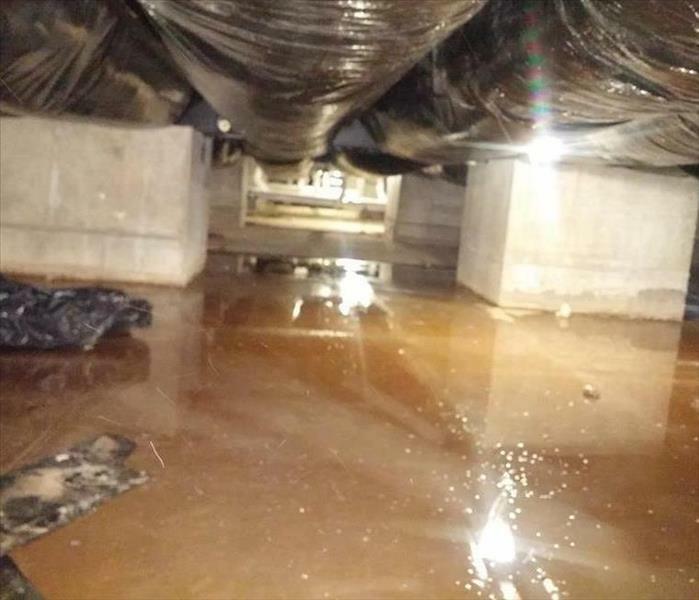 We were called by the property management to this flooded crawl space. They were very happy when we told them we could pump out the water and ensure the space was dried properly. 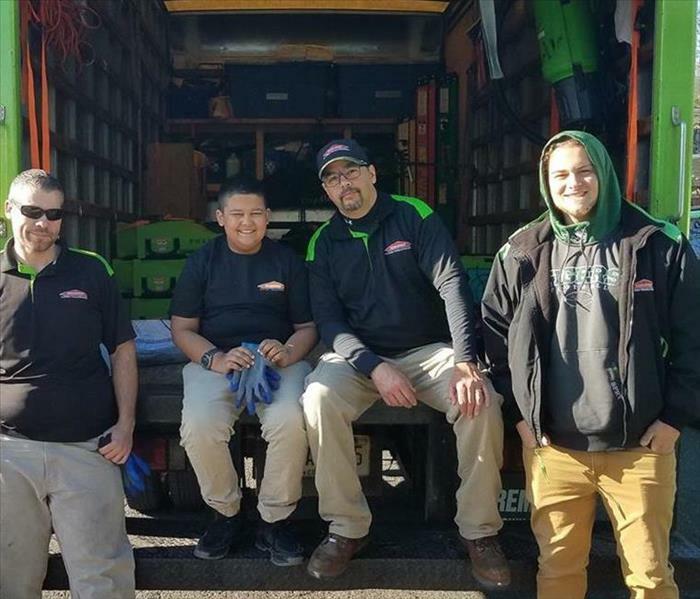 While there are many safety protocols to follow working in a confined space SERVPRO of Piscataway's technicians are well trained in this type of work. 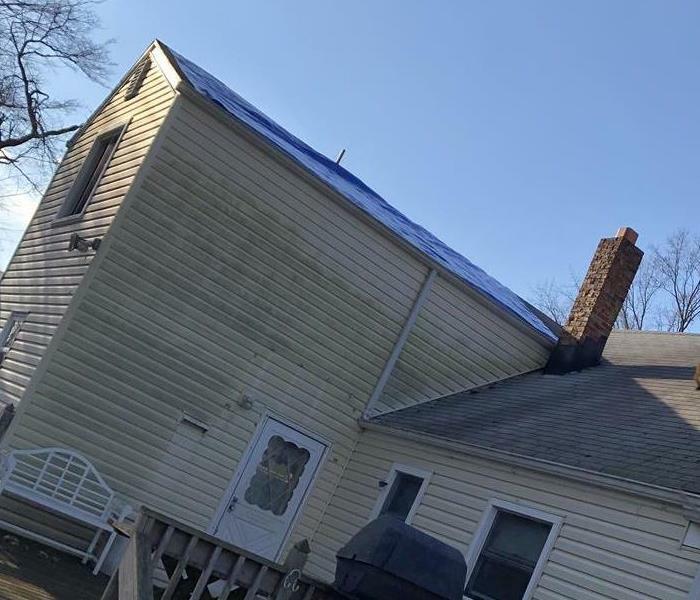 This home owner had a tree come down on their roof in Middlesex, NJ during a rain storm causing damage to not only the roof but also to the bedroom below. 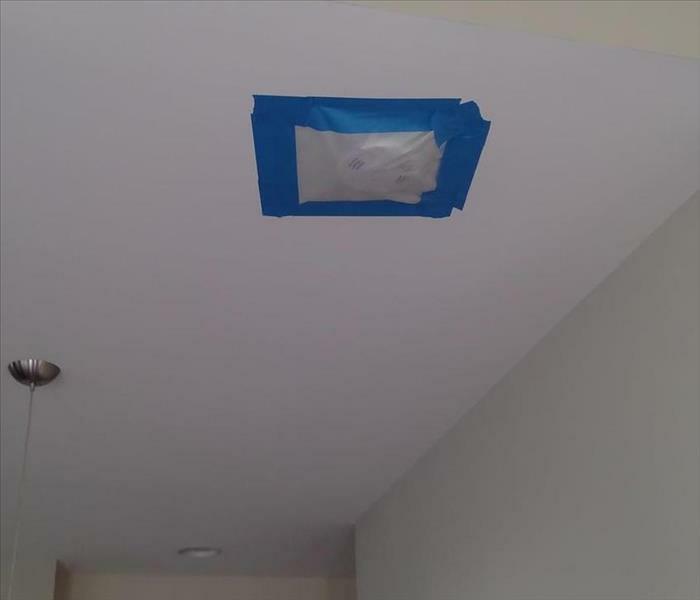 From tarping the roof to repairing the bedroom SERVPRO of Piscataway can handle the whole job. This construction site in Highland Park, sustained water damage to the framing during construction. Multiple floors were affected requiring more than 100 air movers to dry out the entire frame work. It was very important that all materials were dry prior to the insulation and drywall being put in to insure no microbial growth. 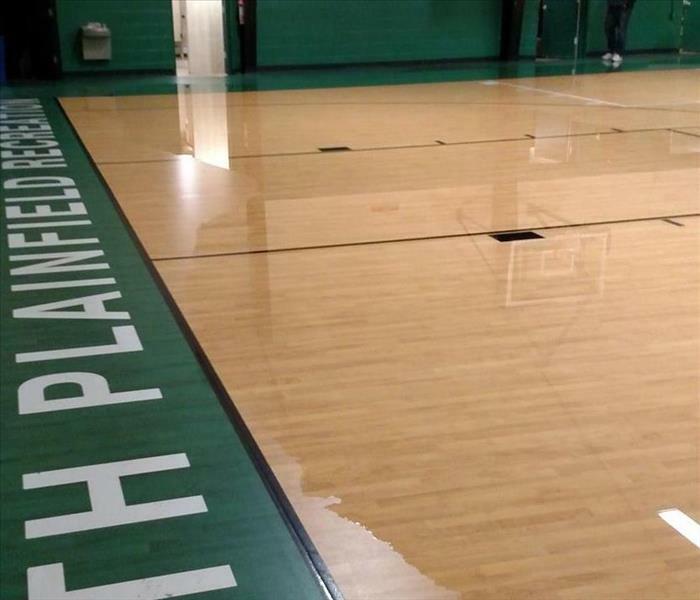 SERVPRO of Piscataway was called to clean up after water damage in a gymnasium in Somerset NJ. There was such a large amount of water from a broken pipe that the blown insulation flowed out the back door like a river. 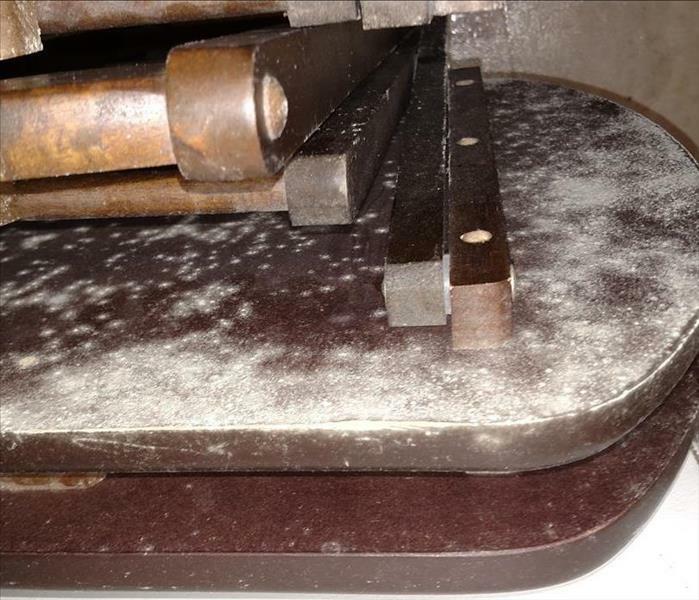 SERVPRO of Piscataway understands that dust from demolition can be very frustrating if not properly controlled while the work is being performed. We take every precaution to control the amount of dust in the air but in case dust levels become too high we even cover the smoke detectors. 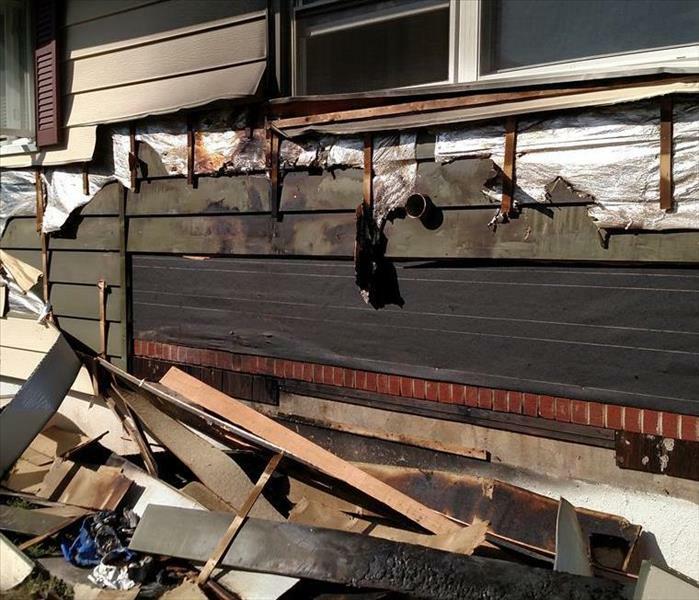 Here is the damage from a fire that started because a BBQ was too close to the side of the house and began burning the siding. The family was home but thankfully an alert neighbor informed them of the fire and they were able to exit the home unhurt. SERVPRO of Piscataway was called to clean the interior of the house which was sustained only smoke damage. The homeowners were very thankful when we completed the job and the smell of smoke and the light coating of soot were gone from their house. Please use caution when barbequing near your home. SERVPRO of Piscatway was called to this house in Warren, NJ for a flood that affected the entire house. It is never a good sign when a fish can live in your light fixture. Before any mitigation work could begin the fire department shut off the main breaker to the electricity. 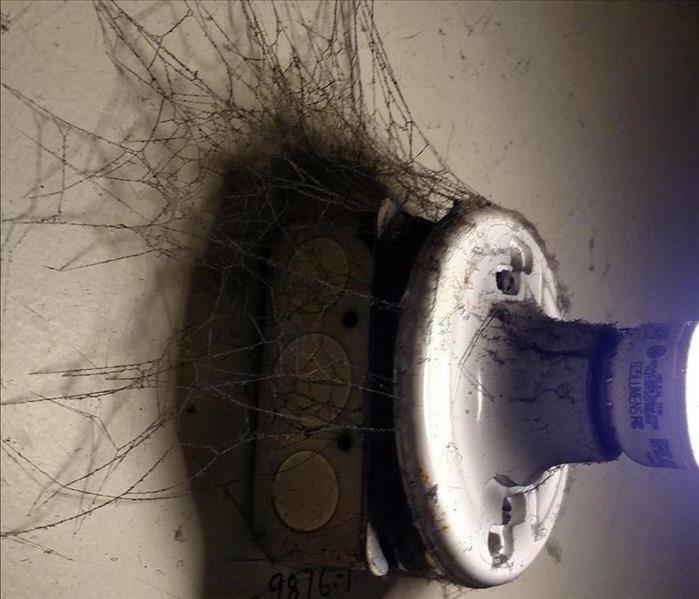 These "smoke webs" are caused by the soot from synthetic/petroleum based materials burning. This sign at a fire is an indicator of the protocol needed to clean up after this fire. 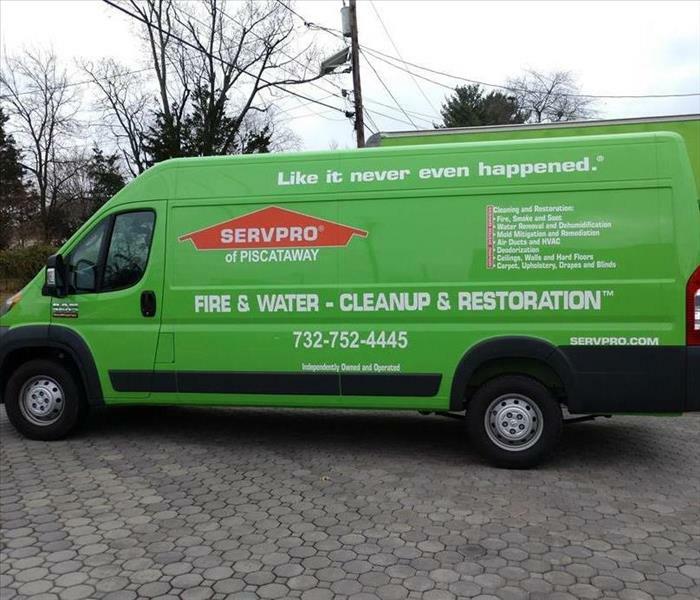 SERVPRO of Piscataway's technicians are well trained in the protocols for each type of fire cleaning. 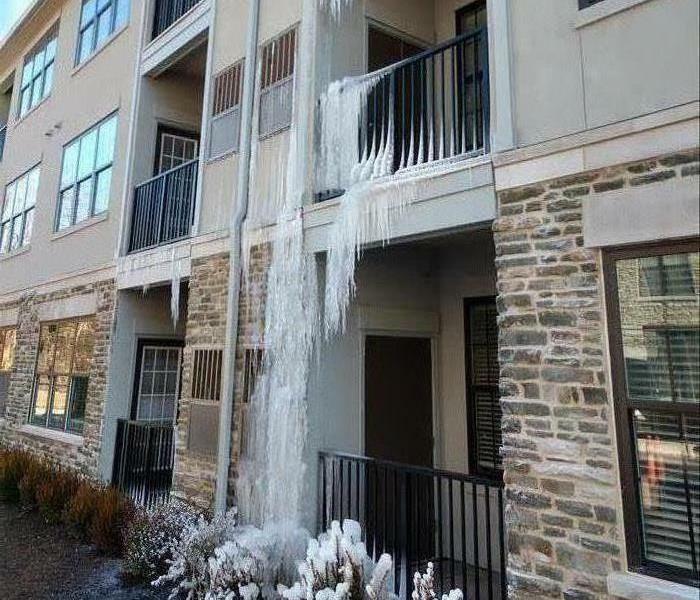 During a polar vortex temperatures were near zero which caused a pipe to freeze on the third floor of this condo complex in Highland Park, NJ. 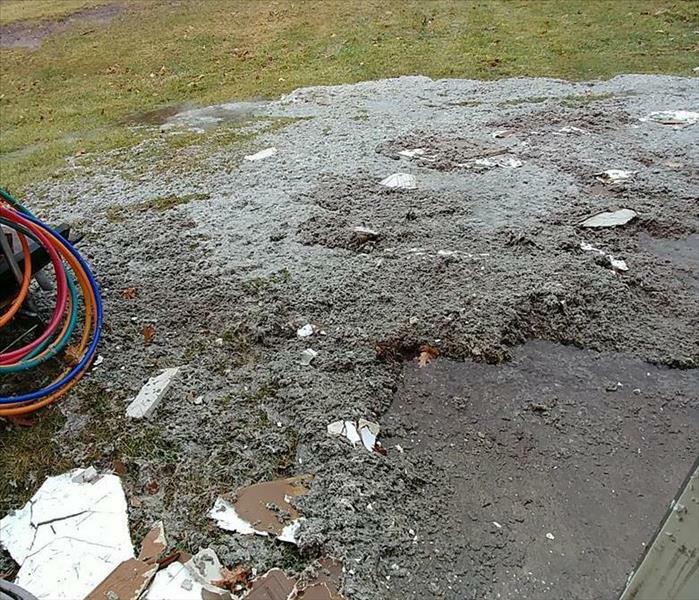 SERVPRO of Piscataway arrived to find this ice waterfall and six units affected. 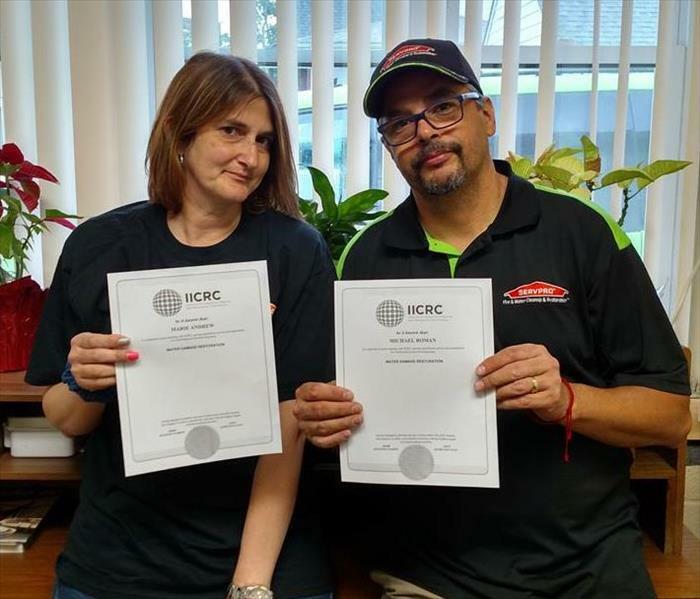 Here are two of our newest employees who have completed their Water Restoration Training through the Institute of Inspection Cleaning and Restoration Certifications (IICRC) which sets the standards for the restoration industry.. Marie is our office manager who does not go in the field but we feel it is important for her to be educated in the process of water restoration for he to perform her job to the best of her ability. Michael has now been promoted to a crew chief since obtaining his Water Restoration Certificate. SERVPRO of Piscataway was happy to have a new technician for the day. Our office manager had her son come to work with her on bring your child to work day to show him the ropes. He was very excited to help the guys load the truck for a water job in South Plainfield. We have expanded our fleet so we are better equipped to respond to multiple losses if needed. We respond 24/7/365 to your water, fire and mold damage clean ups. SERVPRO of Piscataway is very proficient at building containment to insure dust does not impact non affected areas when doing demolition. 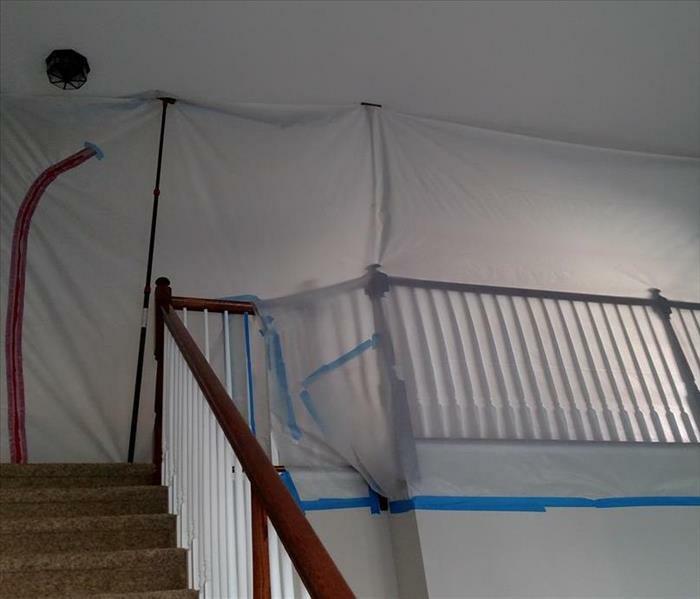 This containment wall was put up to stop dust from a wood floor removal on the first floor from affecting the second floor of the house. The homeowners were grateful they did not have to clean their entire house when we were finished. SERVPRO of Piscataway utilizes the finest high tech equipment while scoping a water loss in Somerset NJ. 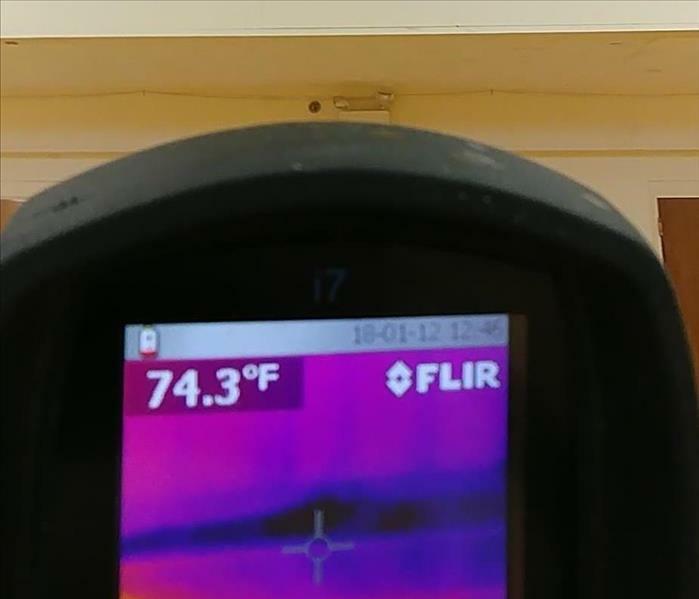 This is a picture of our thermal imaging camera showing how a wall in a gym is affected. 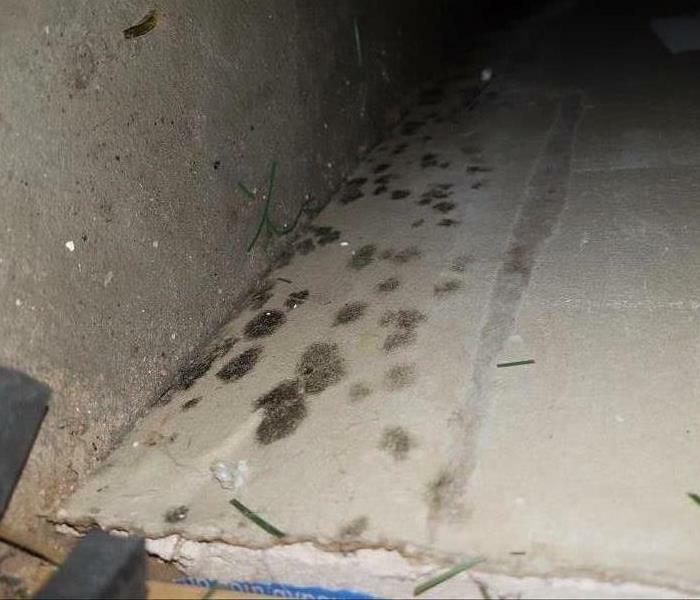 We were called to this Piscataway basement because the homeowner noticed a bad smell. 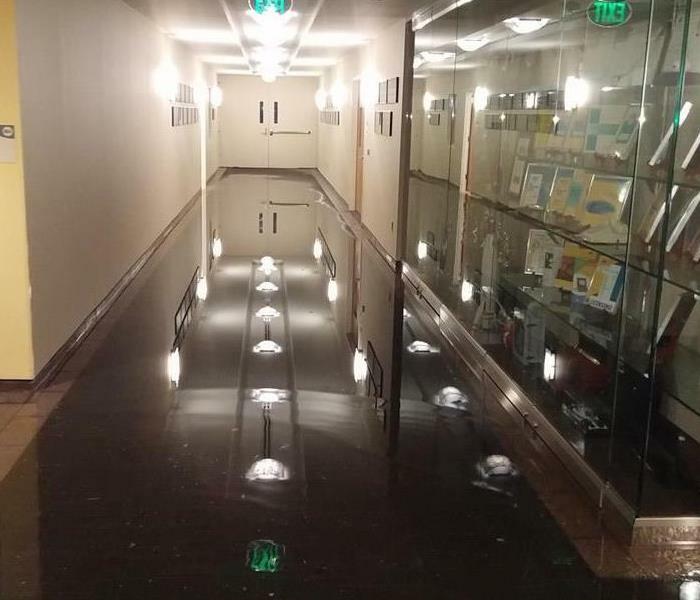 They had a flood and thought there was no problem once the water on the floor was cleaned up but didn't realize that the walls were also affected. We had to do flood cuts all around. 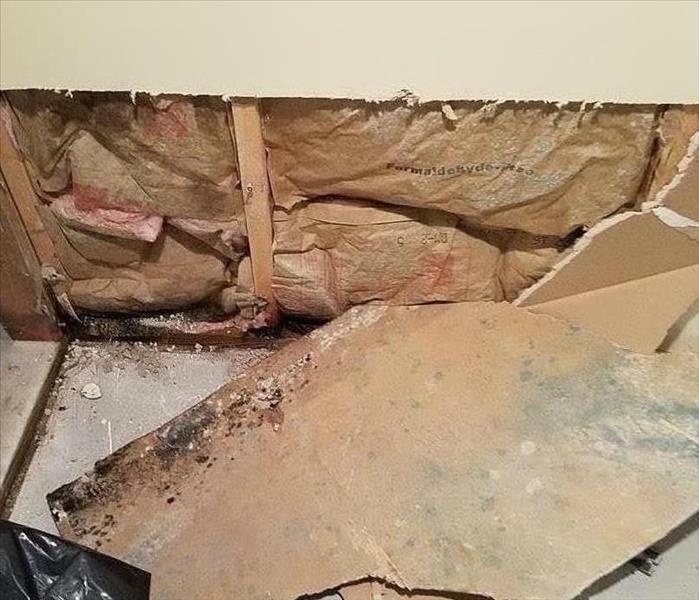 The homeowner of this house was very upset about the extent of damage caused to their home by a frozen pipe that burst during a winter Jersey Nor'Easter. They were very pleased that we worked directly with their insurance to return their home to pre loss condition. 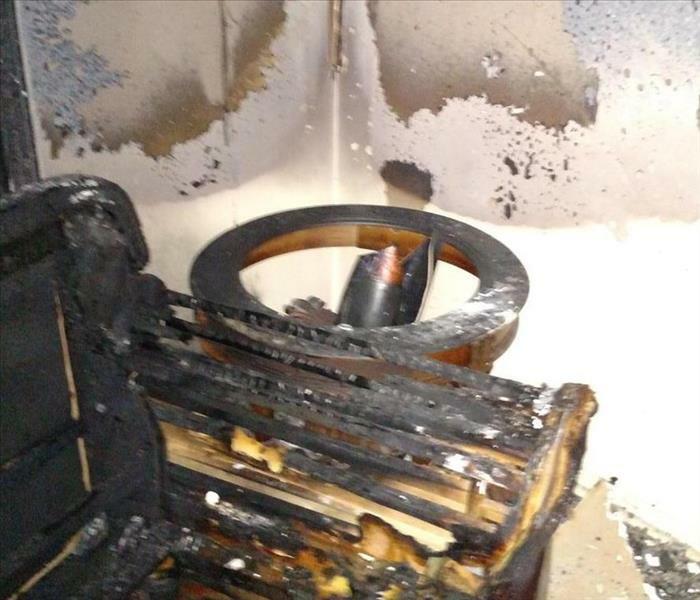 An unattended candle caused this house fire in West Orange. SERVPRO of Piscataway was called in to do the cleanup. 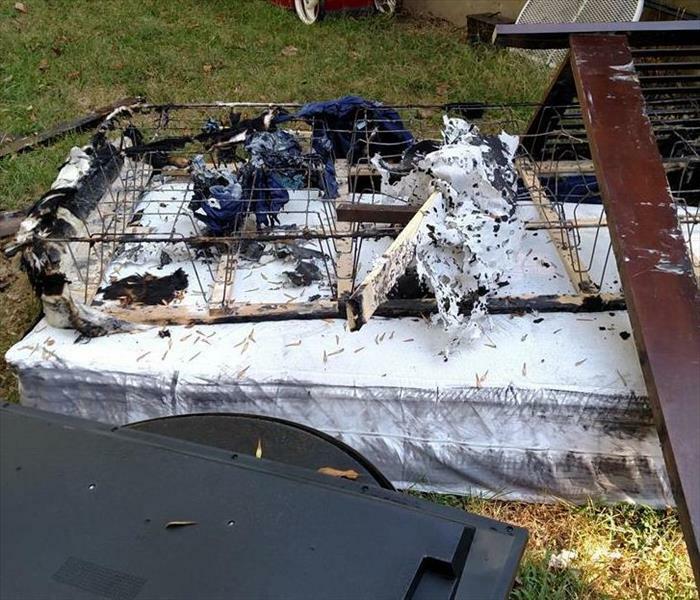 The homeowner was impressed that we were also able to restore his wood furniture that had severe smoke damage. 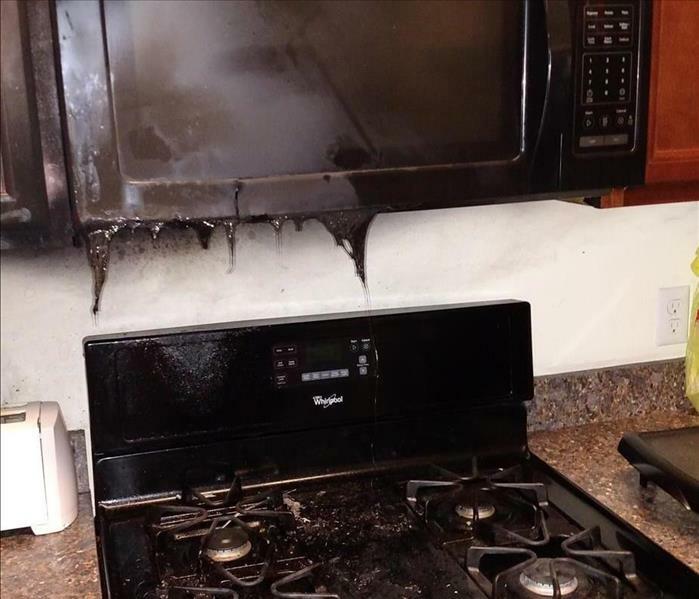 The owner of this Piscataway kitchen left a pot cooking on the stove and went into another room. There was not too much damage from fire but smoke affected the entire house. The homeowner was pleasantly surprised that we cleaned the entire house so quickly. During a New Jersey cold snap a pipe in this house burst while the homeowner was away and water ran for several days before being shut off. By the time we were called in the weather had warmed up. 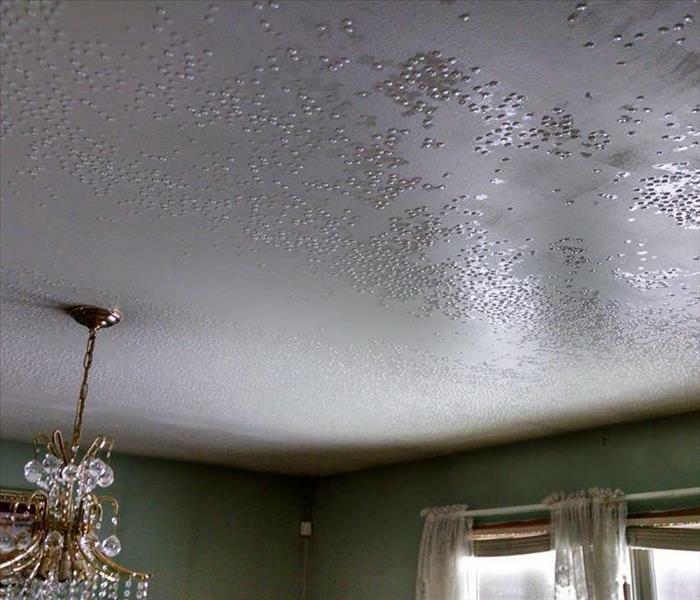 When we arrived the humidity inside the house was so high that these beads of water had formed on several ceilings and it was literally raining inside their house. This homeowner learned a very valuable lesson, albeit a little late, that it is a good idea to shut the water to the house off at the main when leaving for vacation. 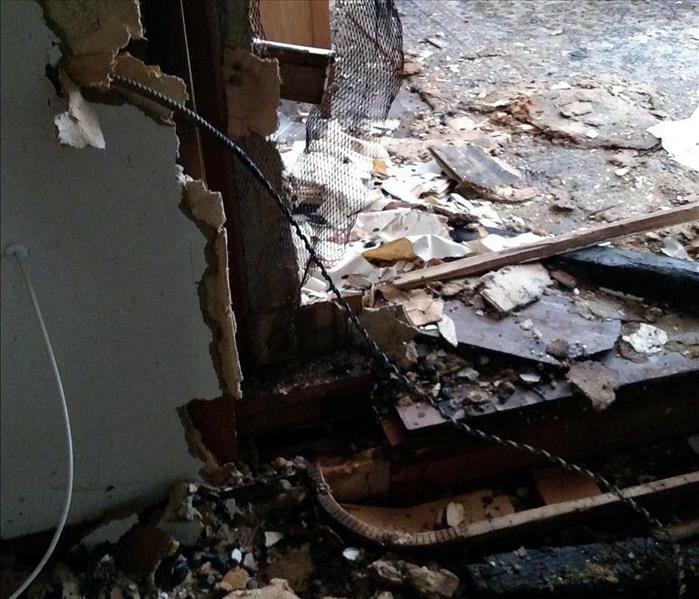 During very heavy thunderstorms the sump pump in this Piscataway basement was overworked and burned out. By the time we were called in there was over 2 feet of water in this basement. 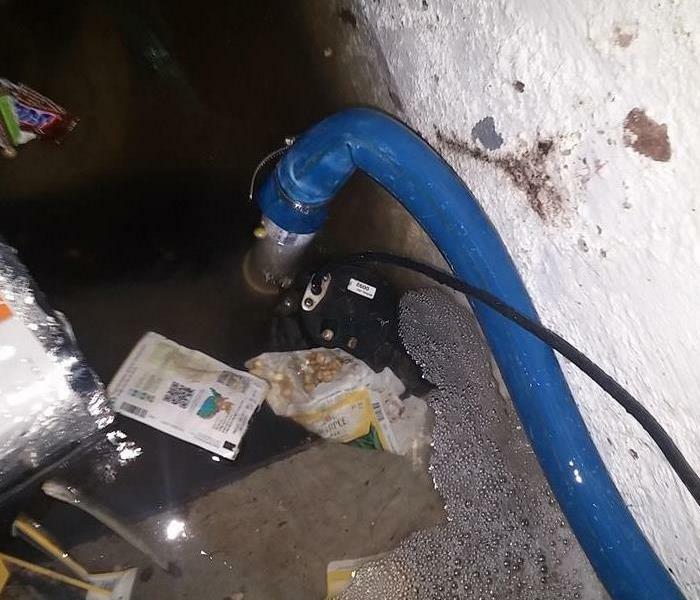 Before the sump pump could be replaced we had to pump out the water using a submersible pump so the plumber can access the area where the sump pump was located. 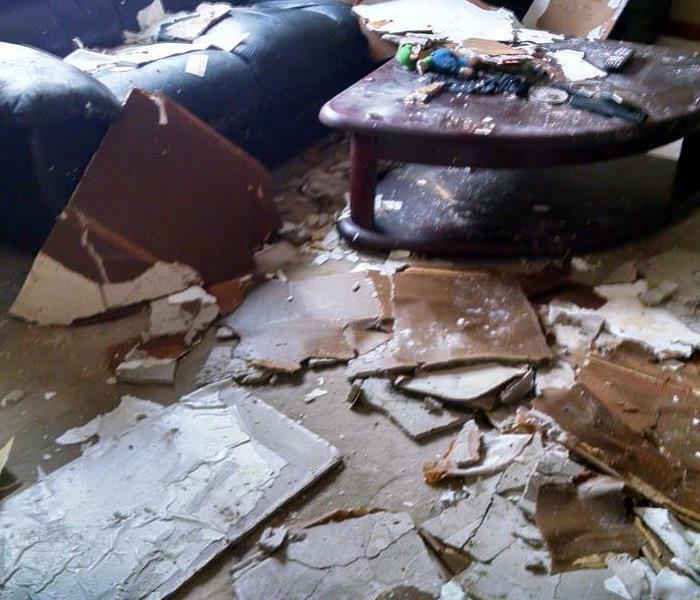 Sadly, this homeowner was storing a lot of things in the basement which were ruined. He has since learned to store things off the floor and to use plastic totes instead of cardboard boxes. Better late than never! 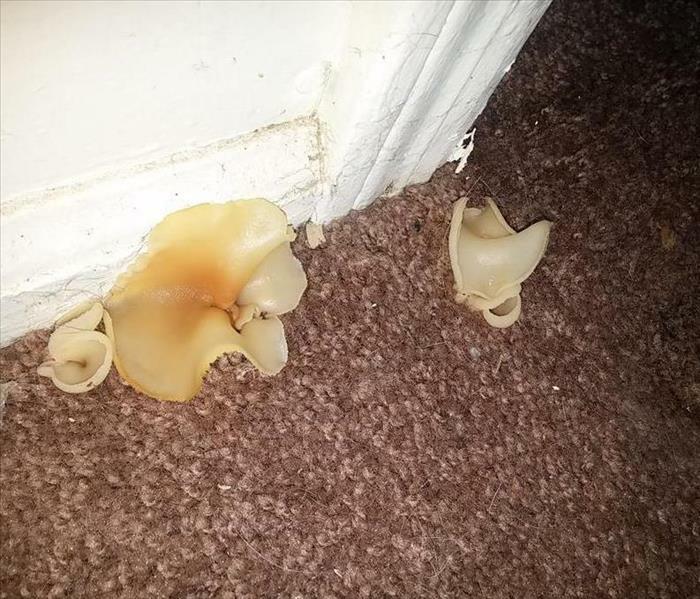 The owner of this South Plainfield, NJ home was shocked to find mushrooms growing on their basement carpet. We discovered a slow leak from a supply inside the wall which kept the carpet wet for some time. Once the pipe was repaired and remediation complete no more mushrooms. SERVPRO of Piscataway was called to this beautiful old Victorian home in Plainfield, NJ that sustained damage from faulty wires in the wall. Thankfully, there were no injuries and when it was repaired it was good as new. A basement with high humidity levels went unchecked for too long and a layer of mold grew on anything organic like this wooden table. 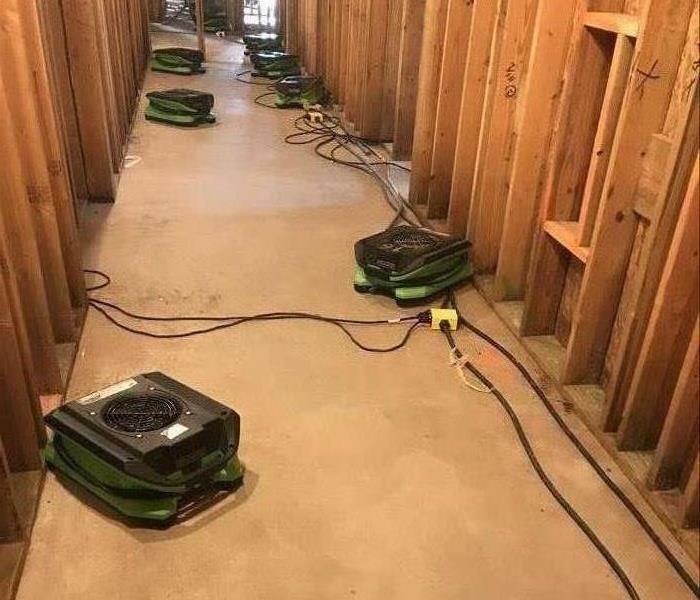 Once the remediation was complete we assisted the homeowner is setting up the proper sized dehumidifier to avoid this in the future. SERVPRO of Piscataway was called to this hotel were a guest knocked into the sprinkler head and flooded multiple rooms. 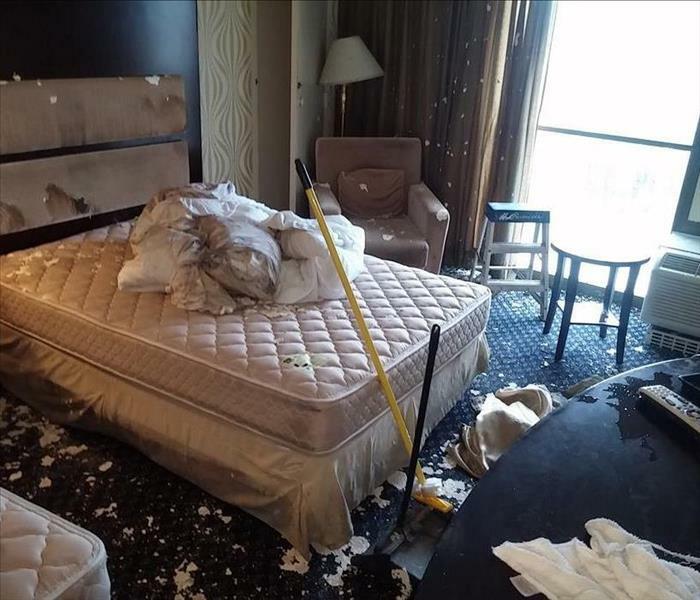 The maintenance staff began cleaning up with a broom and dust pan but quickly realized they would need professional help. We had a commercial building with double layer sub floor. A small area had been affected by a flood and the building owners did not want to remove the top layer. 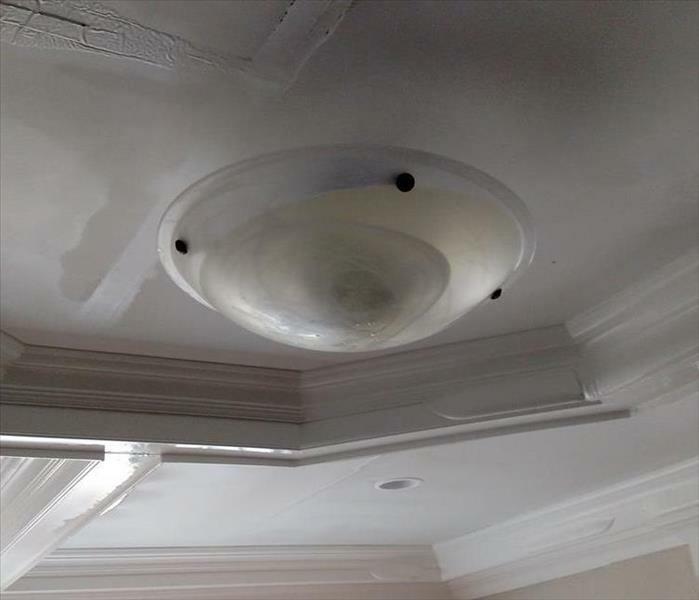 So we covered it with plastic that was sealed air tight and sent in warm dry air from a dehumidifier. It worked like a charm! This is not the kind of waterfall you want to see in your house. 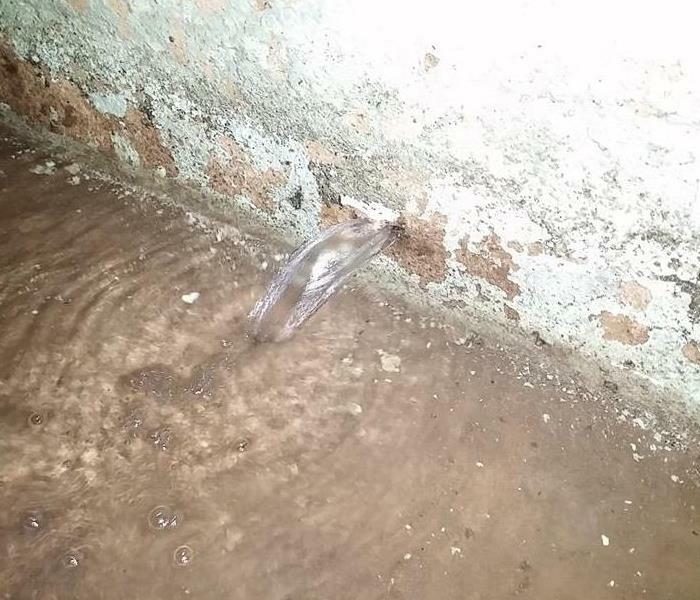 Water had penetrated the concrete block foundation from a broken pipe in the wall. Once the water to the house was turned off we pumped out the basement. Part of the team from SERVPRO of Piscataway who volunteered for the South Plainfield Community clean up. 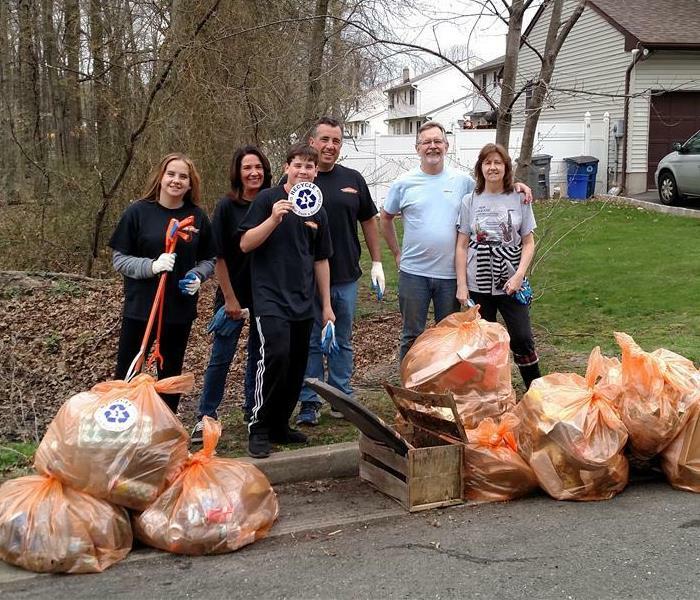 We filled 10 bags from litter picked up from a vacant lot and a stream that ran through it. Well done team! 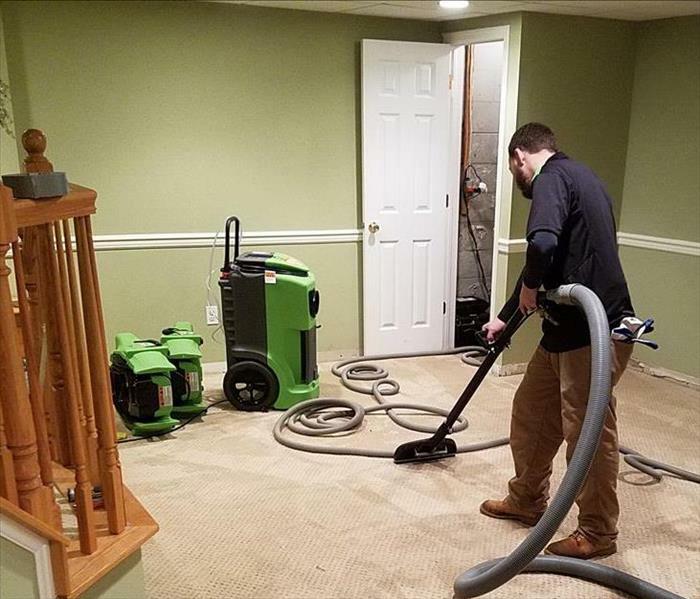 One of SERVPRO of Piscataway's certified technicians extracting water from a customers brand new carpet in their basement. The first step in repairing the damage from a broken pipe. We then place drying equipment to ensure all materials are dry and there will be no worries of any issues in the future. 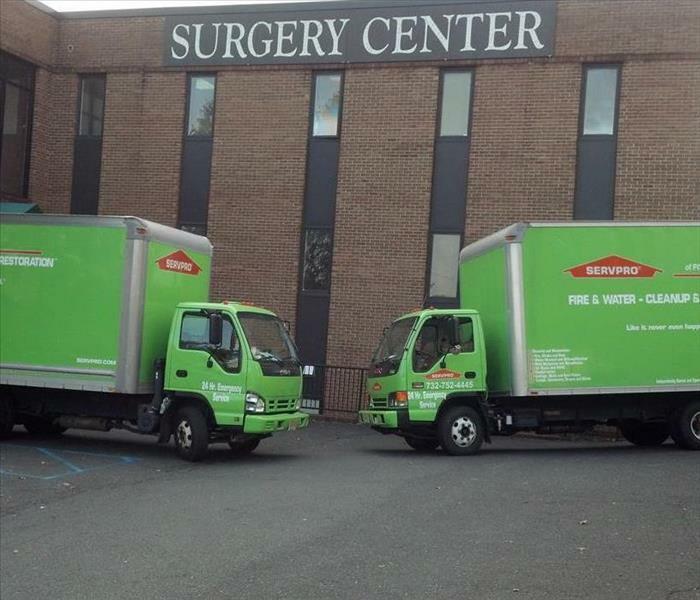 We at SERVPRO of Piscataway can handle any loss big or small. Shown in the picture are our trucks at a 3 story commercial building. A broken water supply line on the top floor flooded all floors below. We had them dried out and back in business as quickly as possible. 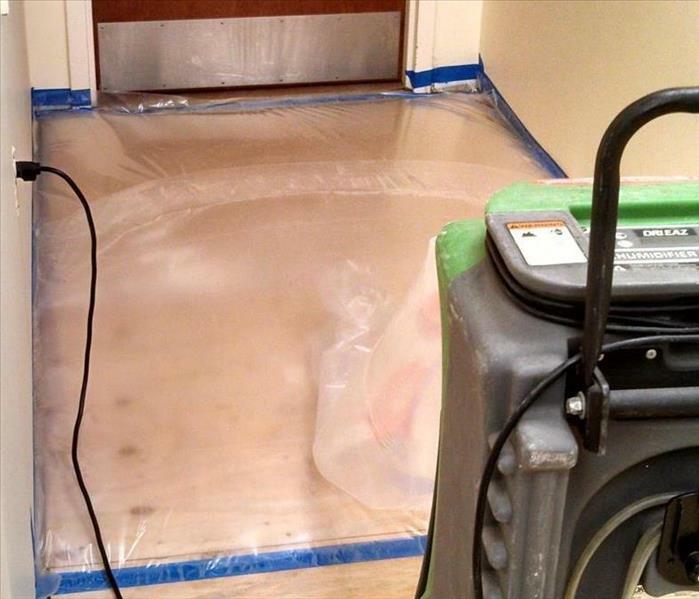 SERVPRO of Piscataway can also take care of any specialty drying situations. 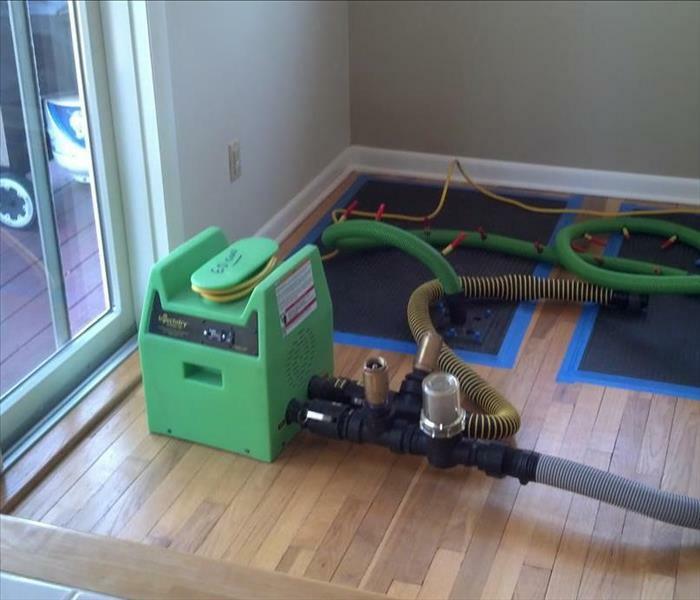 The picture to the left is of our floor dying system which allows for the saving of hardwood floors affected by water. 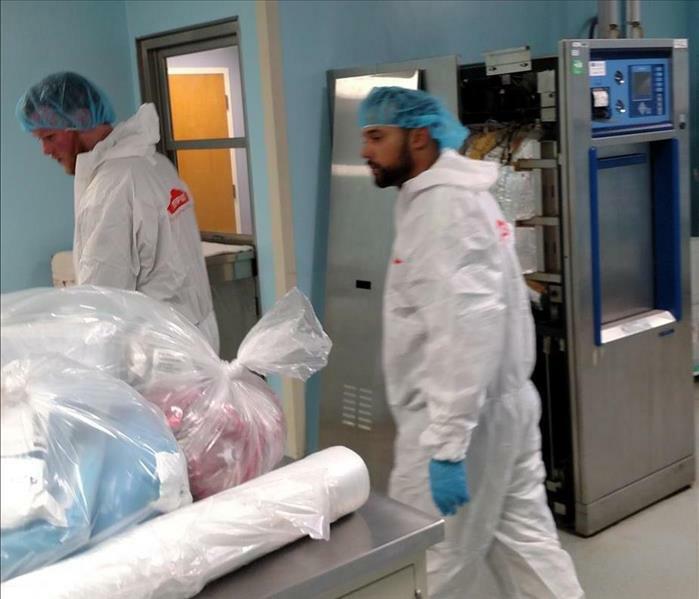 Here are two of SERVPRO of Piscataway's certified technicians doing work in a clean room of a surgical center after a flood. We took every precaution to not further contaminate the area while the work was being performed.